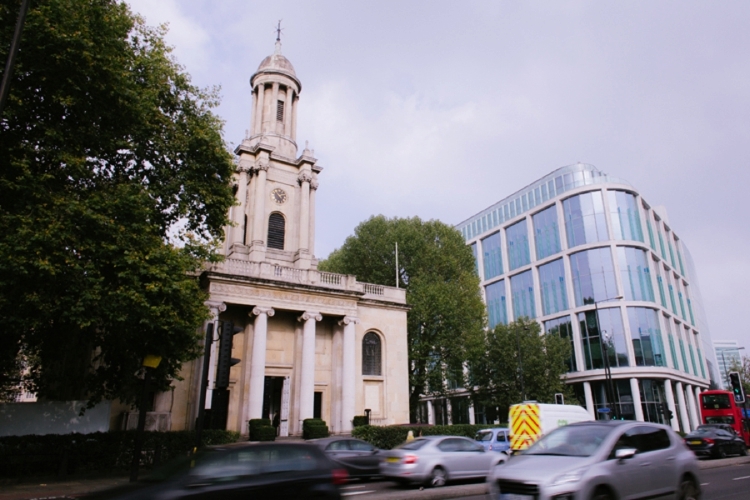 We got married at One Marylebone, a beautiful venue in the heart of London. 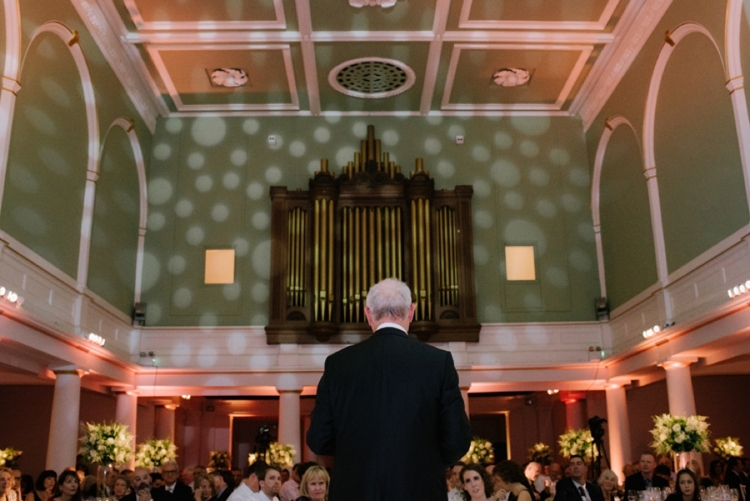 Our main criteria for picking the location for our big day was space, we needed somewhere that could comfortably seat 200 people, plus had a marriage licence. 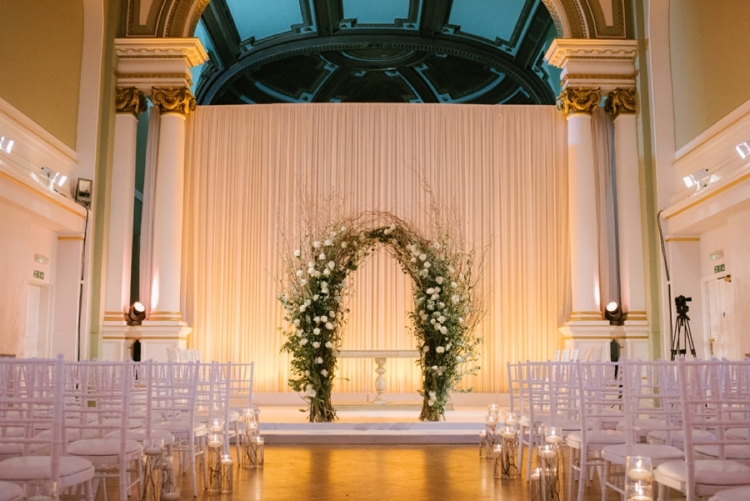 As a mixed faith couple we wanted to find somewhere neutral that would work for all of our guests, but have the elegance and romance of a religious ceremony. 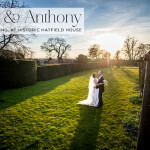 We looked at a couple of venues outside of London and three venues in town, but after hours stuck in traffic on the M25 we realised that we wanted to get married closer to home. I grew up in North London and the prospect of being able to sleep in my childhood bed the night before my wedding was too good to turn down. 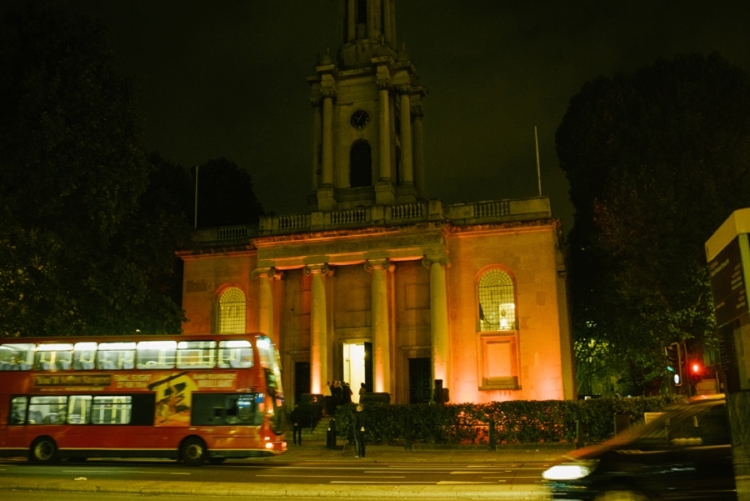 One of my highlights of the wedding day was driving through Hampstead, Belsize Park and around Regent’s Park on route to the venue in glorious sunshine while passers-by shouted congratulations as we drove past — it was one of those moments where I had a huge sense of place and appreciation for the part of London I grew up in. 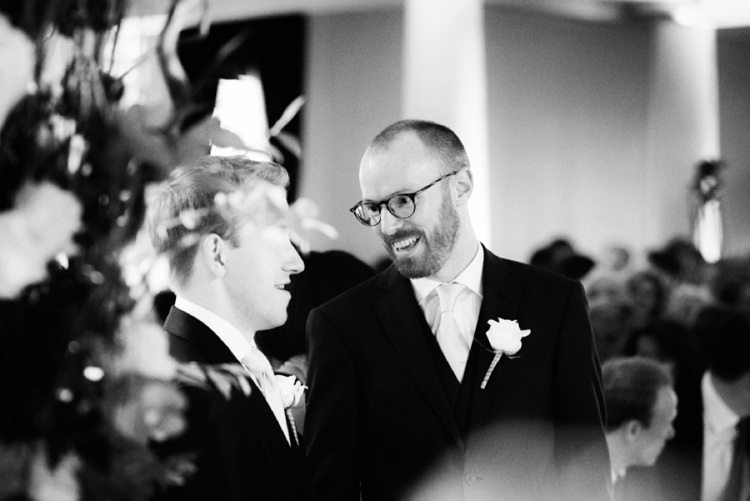 We used a wedding planner, Louise Perry, to help with the logistics but the ideas/schemes all came from Matt and I — we wanted it have a simple yet elegant wedding, our flowers were all white with beautiful greens coming through the foliage. 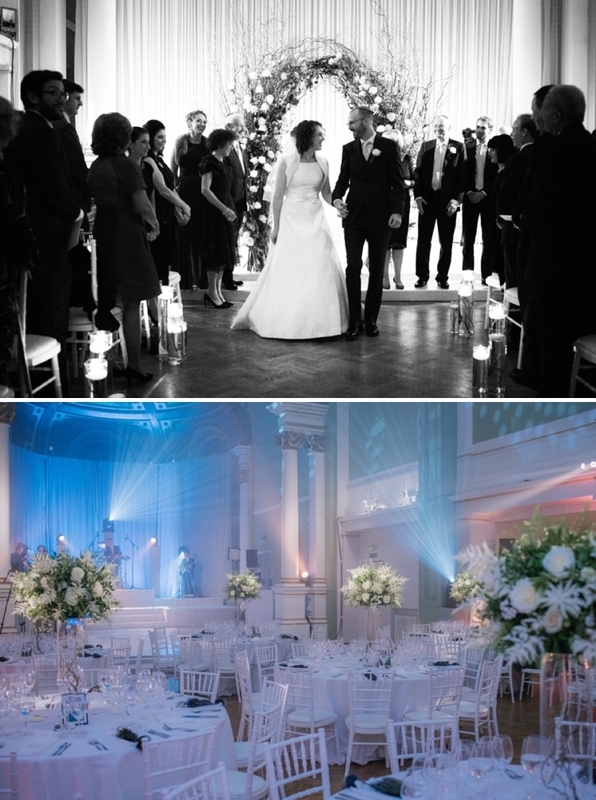 We wanted the room to feel natural, and needed height in our floral arrangements to enhance the stunningly high ceilings. For the wedding ceremony itself we created a beautiful arch of twigs and white roses, a small nod to the classical Jewish chuppah, so that instead of walking under the chuppah together we could reflect walking through an arch into our new life as husband and wife. My sister, Natasha, was our maid of honour, and for our engagement present she bought us a personalised print of our engagement, with the mountains of Capri, the tree under which Matt proposed and Ischia in the background where we had spent the night before. She even ensured that the boat that we took to a restaurant that we went to two days after the proposal was part of the illustration. The graphic designer had written our names beautifully and we decided to use that as the main focus of our wedding invitation. We both fell in love with letter press invitations and used Strawberry Sorbet to print our invitation — it involved a lot of to-ing and fro-ing to get them just right, but in the end we couldn’t have been happier with the finished product. My hair was done by my hairdresser Kerry from Galliano’s in North Finchley — she has cut my hair for the past decade so there was no question about anyone else touching it! Life with curly hair is tricky so I washed and dried my hair earlier in the morning and then she set about fixing/plaiting the rest of my hair so that I could have it down but out of my face. She recommended the fantastic Kate Silver to do my make-up. Both Kerry and Kate were the best people to be surrounded by on the morning, I was pretty nervous and kept shaking and then calming down and then getting nervous all over again — luckily they are both friendly, fun and really easy to be around! I couldn’t have been happier with my face make up and Kate made a huge effort to ensure that we were happy with our looks and that we looked like us. I’ve since bought lots of the make-up that she used on me as it was so well suited and I couldn’t recommend her enough! My bridesmaid / maid of honour / sister! I only had one bridesmaid, my maid of honour and sister, Natasha. The only rule for her outfit was no white, red or black — so we went off to Selfridges, Matches etc to try and find the perfect dress for her. 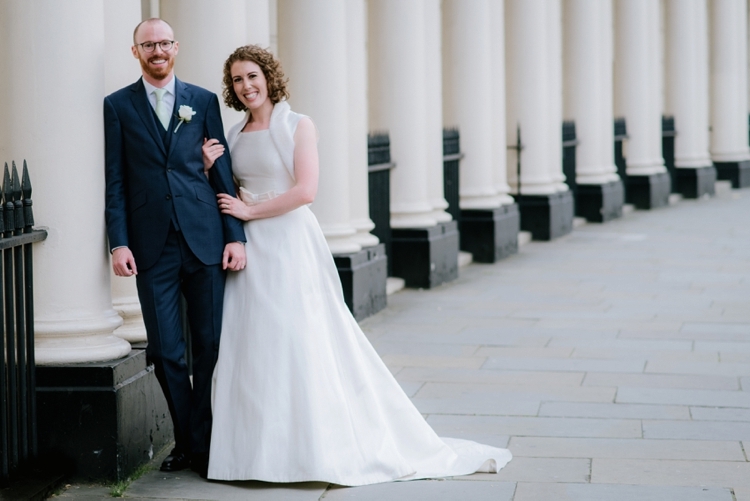 In the end we found a gorgeous dress on The Outnet by Alice and Olivia, it was a beautifully rich burgundy, which matched the pale green ties, navy suits of the men and my mother’s dark green dress, which meant that we had a stunning autumnal palate. She was also lucky to have a fur stole made by Hockley — the back of her dress was cut-away with a leather strap running down her spine, and they tailored her stole to show off the cut of the dress and the colours were perfectly toned! The perks of being a furrier’s daughter! 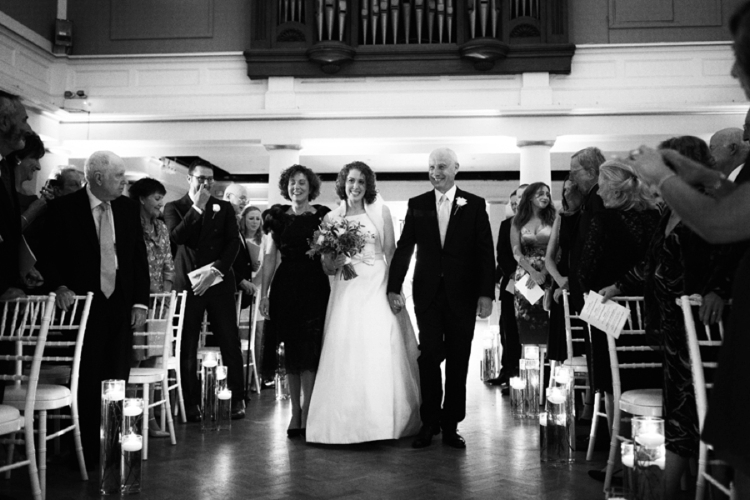 My dress came from Ritva Westenius on Connaught Street, and was their ‘Gina’ dress — a simple Audrey Hepburn style dress made from Zibeline silk in Ivory. It is a beautifully classic dress with a simple line and timeless elegance, which perfectly matched our simple yet stylish theme. 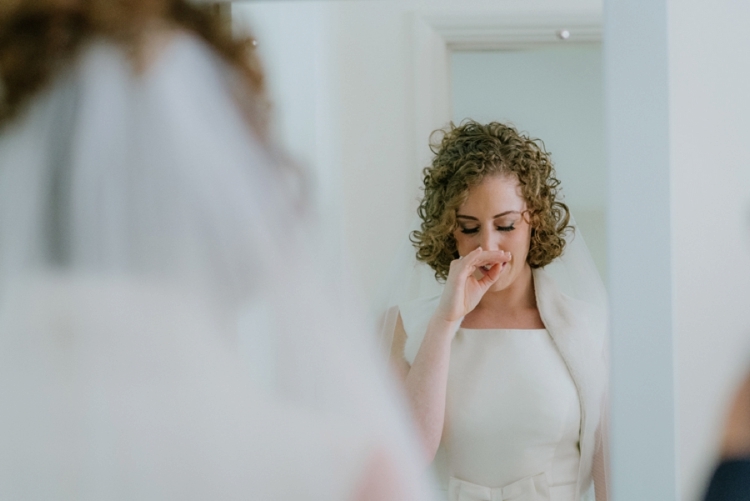 When we went dress shopping I found it difficult to know what ‘type’ of bride I wanted to be – it was the most frequently asked question on arrival in a bridal boutique, did I want to be a romantic bride? An elegant bride? A classic bride? 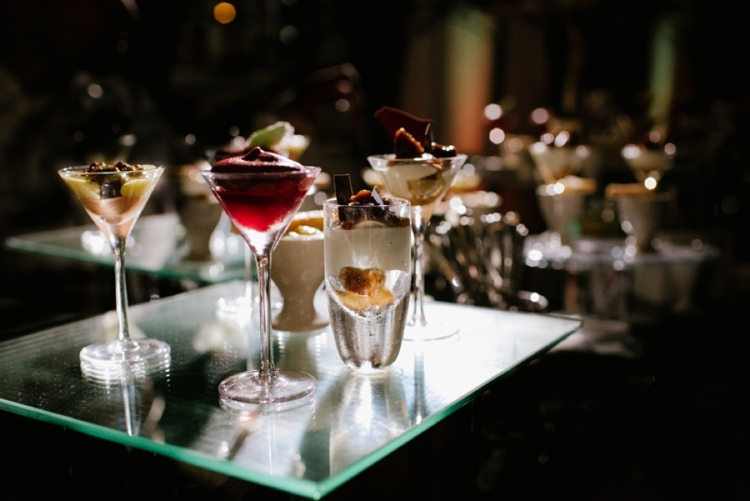 It was all quite overwhelming and confusing as a newbie to the wedding industry, to understand the differences by these seemingly similar but polar opposite descriptions. I essentially wanted to look like a ‘Lucy bride’ and after trying on countless dresses we soon realised that as my hair is one of my most notable features that lace near my face, a veil and my hair was all a bit much and overcomplicated — we needed to pair it down. 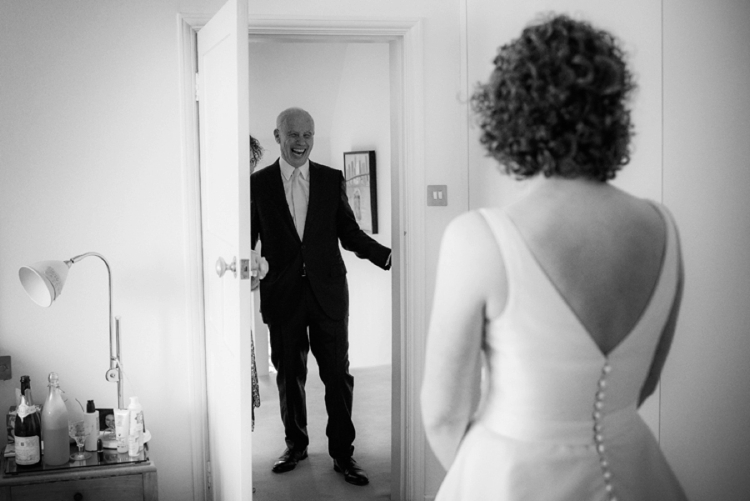 When I tried on the Gina dress we just knew, I looked in the mirror and saw myself, rather than seeing a ‘bride’ looking back at me. 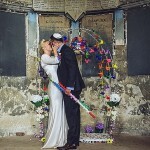 Blue shoes… and white wedding converse! Finding the shoes was one of the trickiest parts of the wedding ensemble, but I’d decided quite early on that I wanted to wear blue shoes. One would assume that living in London with access to all the shops a girl could want that it would be relatively simple to find a pair of blue shoes — I was wrong! Every shoe I tried on was either 4-5 inches high or a kitten heel — I eventually found a beautiful pair of shoes online at Uterque for the bargain price of £75! Later in the evening I changes my shoes into a pair of white Converse — an excellent decision as I was immensely comfortable, didn’t need to worry about sore feet and much much easier to spin in circles during the Israeli dancing! My dress was enhanced by a beautiful shrug made in conjunction with Chenca at Ritva Westenius and the brilliant team at my father’s shop Hockley who perfectly dyed and matched some mink to wear on my shrug so that I had something to cover me during the ceremony. 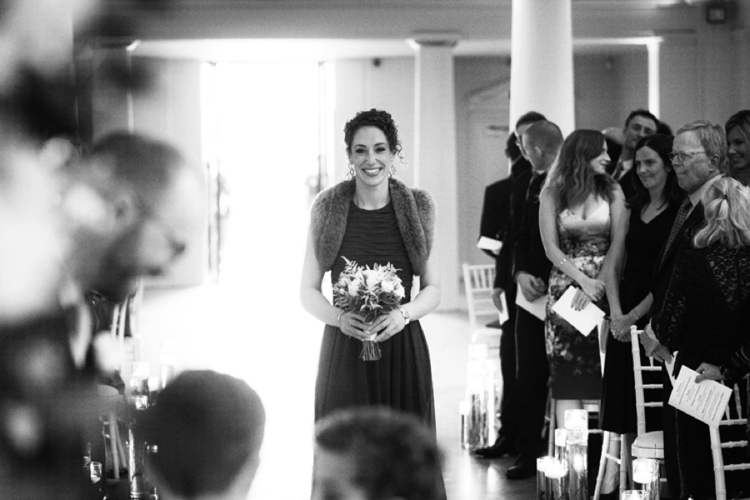 They came to the dress shop with me and helped design a cover that flowed perfectly with the shape of the dress, but also meant that I could wear my fur from my father as I walked down the aisle. 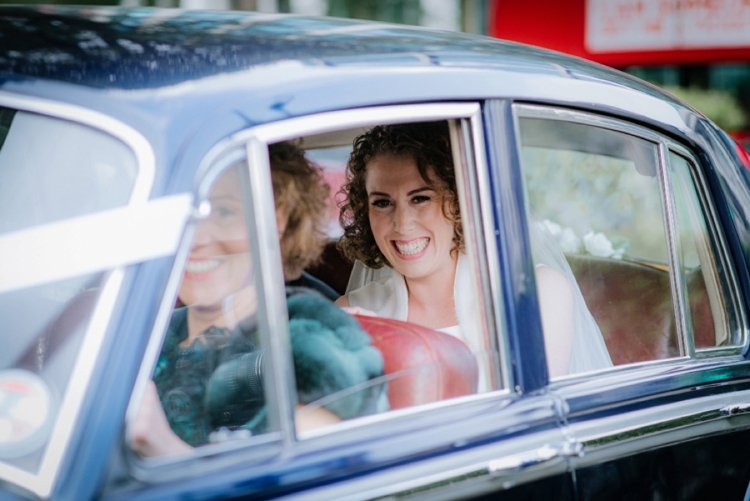 It was at this point we started to think about my something old, new, borrowed and blue and that was when my mum found her old dress in the attic. 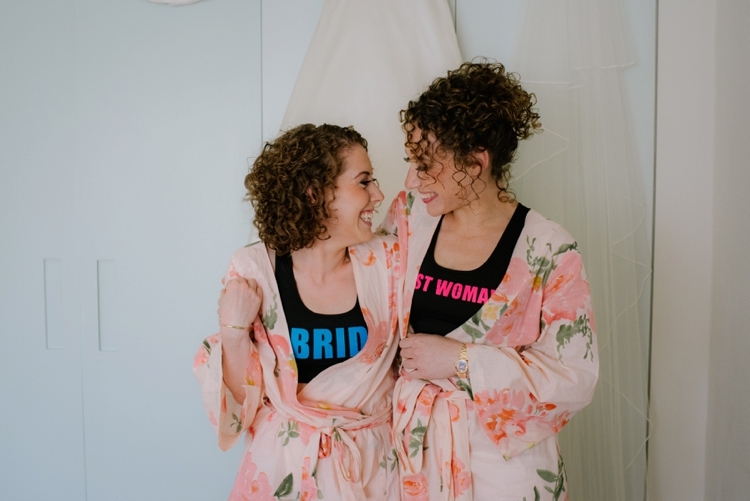 We used some of the silk from her wedding skirt to create the lining of my shrug and it was hugely important to me to wear something around my shoulders that consisted of materials from both of my parents. In terms of jewellery, I wore a simple bracelet that was my wedding present from Matt, but otherwise I wore no jewellery other than my new ring! 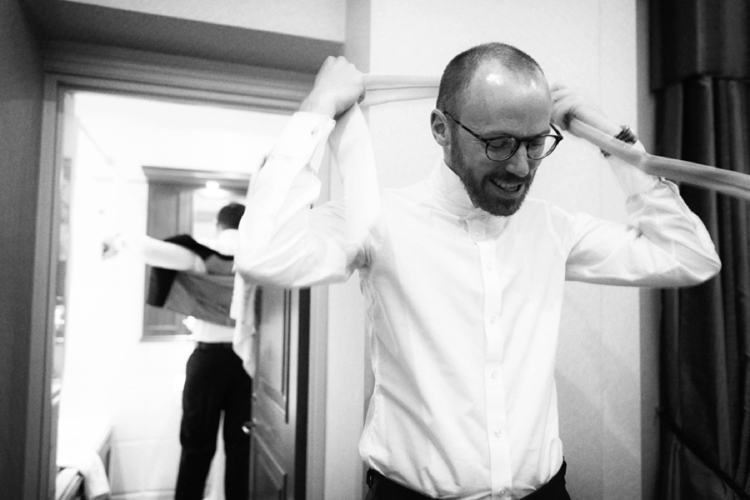 Matt wore a three piece suit from Hackett, he usually wears their suits for work and their slim fit cut fits him brilliantly, he had a pale green tie from Drakes, which matched the rest of the wedding party. The day before he had his beard trimmed at GEO Trumpers so he looked neat and fresh. He wore a pair of monk strap brogues from Church’s and cufflinks that I bought him as his wedding present from Alice Made This. He wore his favourite Oliver People’s glasses and looked his usual smart self — he is always very well dressed and smartly turned out, and has a little addiction to buying ties so he spent hours trying to find the perfect shade to wear on the day. As we weren’t having a Jewish ceremony we couldn’t have a chuppah* but we wanted something that created a similar environment. I have always enjoyed the moment in a wedding when the couple step under the chuppah together for the first time, so the fantastic Lisa at Blooms and Bows spent hours looking on pinterest and for inspiration to see how we could build a beautiful arch out of roses and twigs that would be a good half-way house! 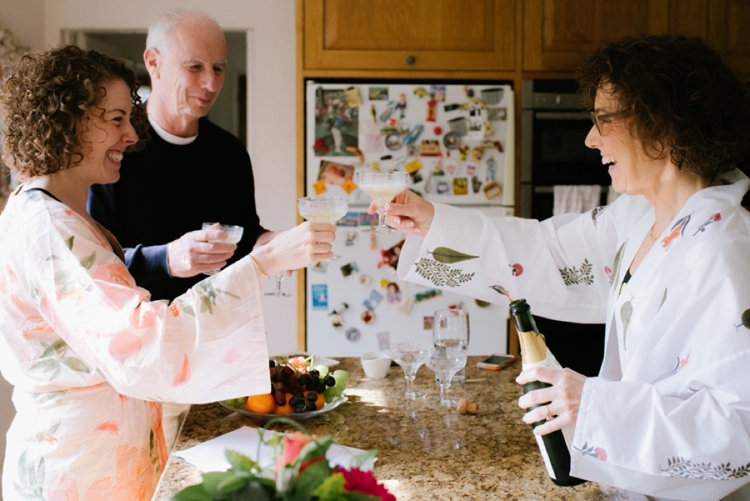 * Note from Karen : This isn’t strictly true — anyone can marry under a chuppah structure, regardless of faith and what kind of ceremony you are having. 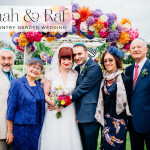 I personally feel that a chuppah is a wonderful space that also beautifully includes family and loved ones. Some rabbis restrict mixed faith couples from having a chuppah because it looks too much like a Jewish wedding, but anyone is free to marry under one if they wish to. One of the main highlight’s of the day for us was the ceremony, as it was completely tailored to us as a couple and the home we plan to make together. 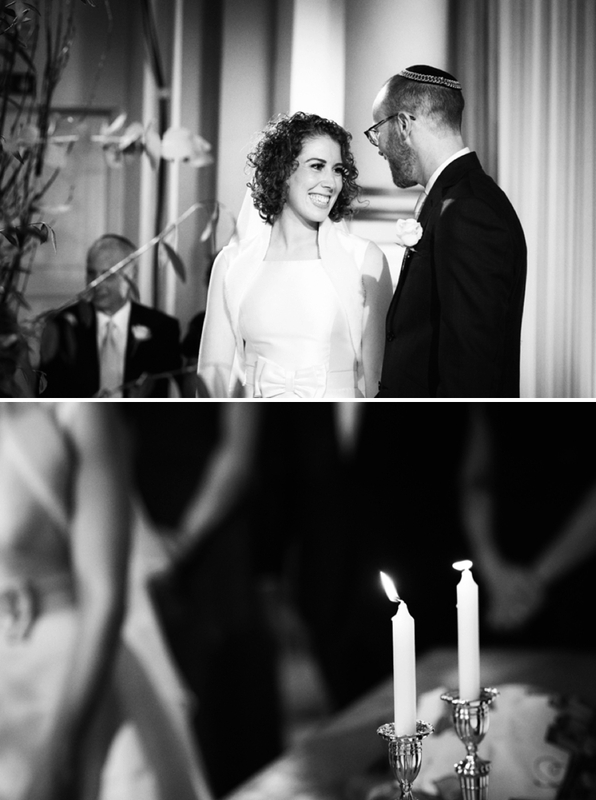 Our ‘Jew-ish’ Wedding was a combination of my Jewish heritage and of Matt’s Christian upbringing. I have a strong connection to my Jewish roots and my weekly Friday night dinners at home are of huge importance to me, and in turn Matt has come to love his Friday Night chicken soup and attending Jewish festivals — he even came to Erev Rosh Hashannah dinner straight from the airport on route home from his stag do — now that is dedication! 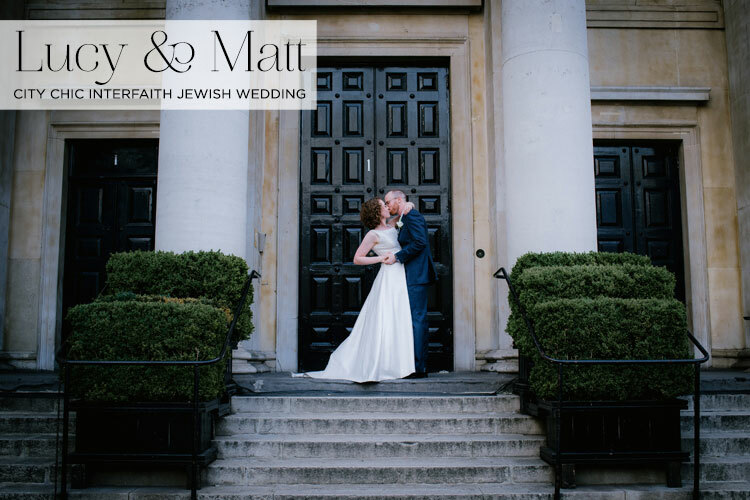 In the run up to the wedding we had marriage classes at Alyth synagogue and were blown away by their progressive attitude towards mix-faith couples. They were so welcoming to Matt and I as a couple, and encouraged us to attend their gateway/intro to Judaism classes so that we could learn together as a couple and discuss, from an educated position, how we would like to broach potential religious conflicts and bigger questions about how we will bring up our children. 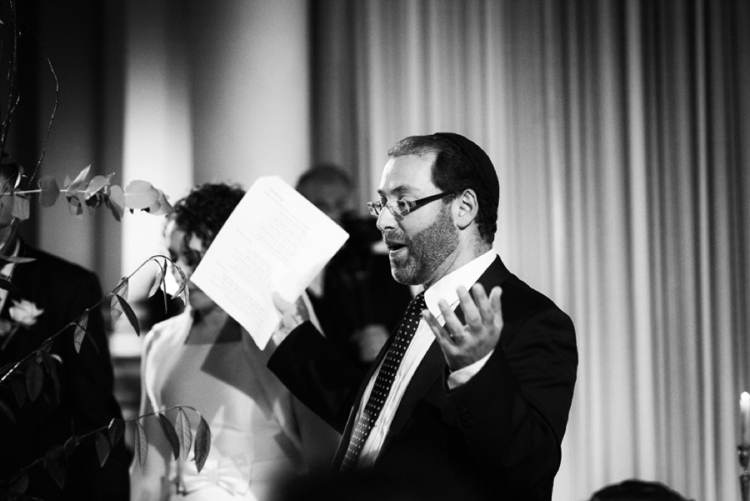 We spend a lot of time talking to Rabbi Josh about how we could reflect our mixed heritages in a ceremony and how best to look ahead to our marriage and what it would mean in the future. 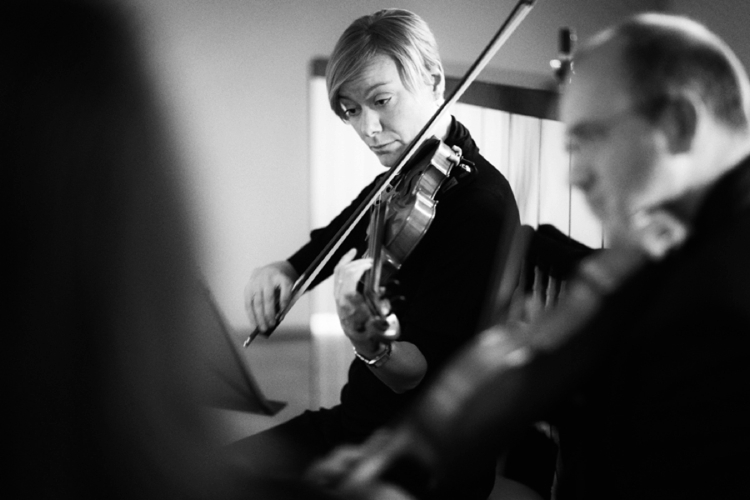 On the day itself I walked down the aisle to the stunning strings of the Crystal Palace String Quartet playing Bach Air on the G String, where we were civilly married by a register from Westminster Council. 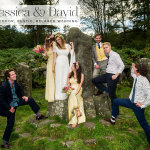 To give the ceremony a few personal touches we had readings from Wuthering Heights , my favourite piece of literature and an extract from One Day by David Nicholls, a novel that reminds us both of when we were first dating. 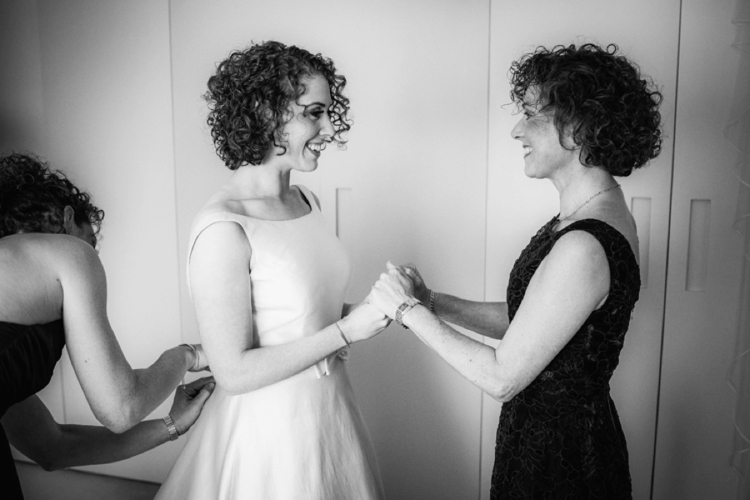 Our mothers were our witnesses — another touch to demonstrate how important our families are to us and how centred our marriage is around the family we can build together. While we signed the register the quartet played Bach Sheep May Safely Graze followed by Vivaldi Spring from the Four Seasons, a piece of music that I adore as I teach contemporary dance classes and this is a piece of music that is frequently used. At the end of the civil ceremony the quartet played Erev Shel Shoshanim, a beautiful piece of music to signify that we were moving into the Jewish segment of the wedding ceremony. This signalled the start of the second ceremony, the Jewish ceremony to celebrate our marriage. We wanted to demonstrate that we have committed to make Judaism a part of our family life, and to build a Jewish home together. The ceremony was built around three main symbols of the Jewish home which are used in the Kiddush on Friday night: Candles, Wine and Challah. For each, we used family heirlooms and wedding gifts: Shabbat candlesticks that used to belong to my Great Grandmother, a Kiddush cup bought by us together, and a challah board, a gift from my Grandmother Shirley. The ceremony wasn’t particularly religious but it focused on the cultural elements of Judaism which are a big part of our family traditions. 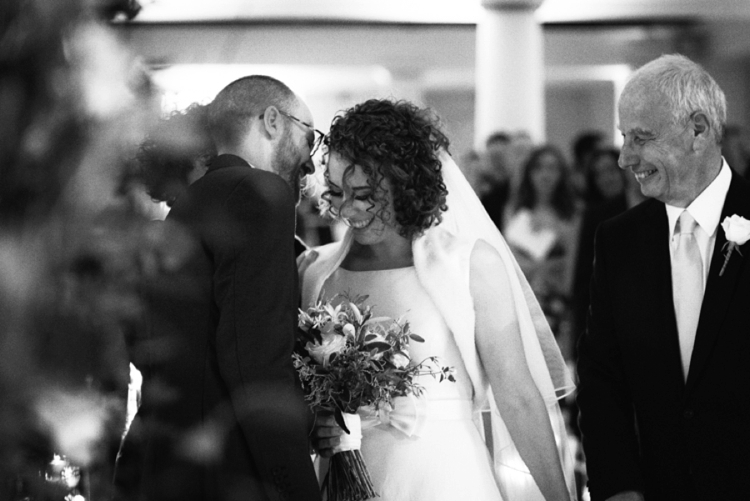 One of my favourite moments of the ceremony was repeating the words of love from the Song of Songs: ×Ö²× Ö´×™ ×œÖ°×“×•Ö¹×“Ö´×™ ×•Ö°×“×•Ö¹×“Ö´×™ ×œÖ´×™ (Ani l’dodi, v’dodi li) I am for my beloved and my beloved is for me (Song of Songs 6:3), it expresses such a simple and yet profound sentiment and demonstrates how we work together as a couple — whether it is combining our faiths, planning a wedding or just the way we approach life together. 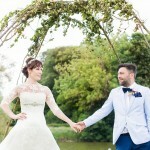 Lisa at Blooms and Bows brought our wedding ideas to life with some stunning creations! 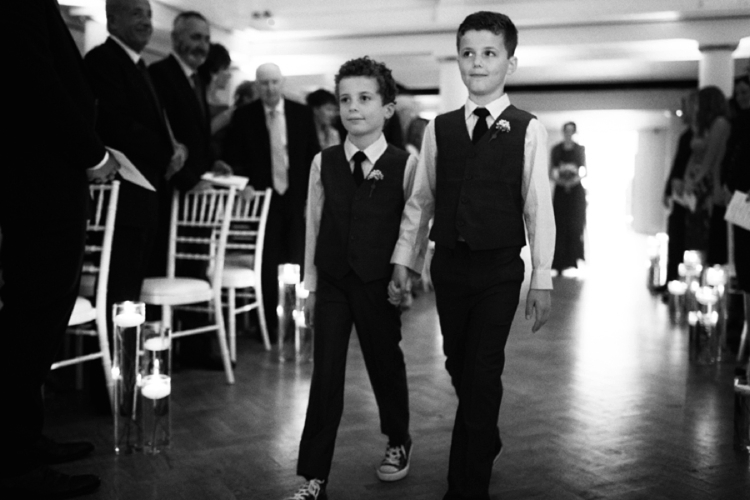 The men wore cream roses as their button holes, with the page boys having smaller button holes of gypsophila. 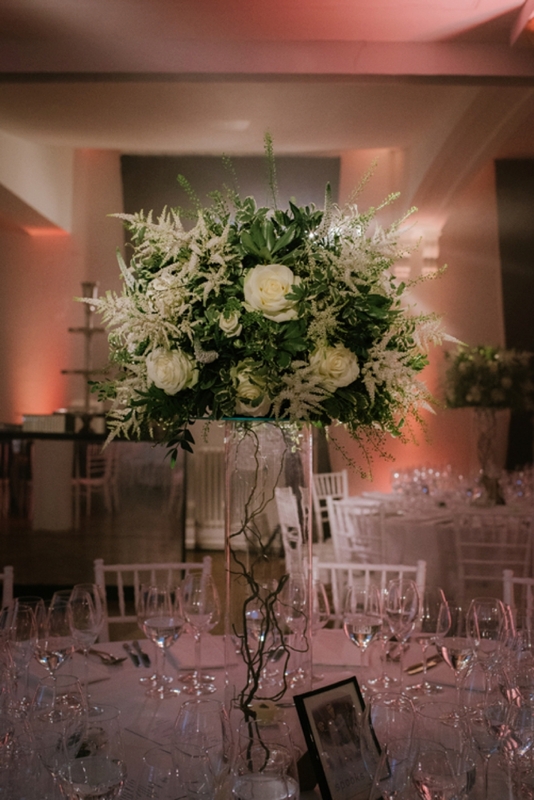 All of our flowers were in beautiful creams with lots of foliage coming through, we were very keen to have flowers that looked alive and weren’t too stilted — the centre pieces were absolutely stunning, and twigs ran through the vases to reflect the arch we’d used for the wedding ceremony. For our table names – we wanted something with a bit of personality and named the tables after our favourite box sets! The top table was, of course, The Good Wife , a table of friends with the most jewish couples on was Friday Night Lights , my dad’s poker playing friends were sat on House of Cards etc! 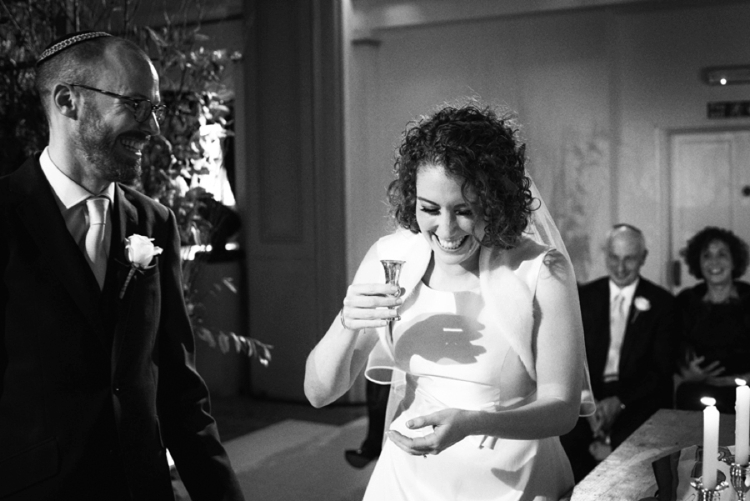 For those of us who go to Jewish weddings often, I’m always surprised by the muted start to a traditional wedding — I love how post dancing everyone sits down at their tables smiling and upbeat, immediately open to talking and mixing with the other guests at their table. We really wanted to capture the excitement of the day, and start the party with a bang. About 6 weeks before the wedding we invited all of Matt’s friends over to our flat, and hosted a small Israeli dancing lesson. While there is nothing that can prepare you for the sheer madness of running in circles and being thrown up in the air — it was great that the boys had a vague idea of what was going on so that on the day they knew to get stuck in. Halfway through the dancing we merged the groups of men and women and having a big circle of our new family all joining in together was a highlight of the day. The fantastic Sensation band for the evening. One of the key elements of the wedding was having a big band, the bigger and louder the better! We were there to party and have a massive celebration and Sensation definitely made that happen. But the best musical interlude came from an old childhood friend Ben, who happens to be the spitting image of Macklemore and got up on stage and performed Can’t Hold Us by Macklemore and Ryan Lewis. As you can see from the photos he really got the crowd going! It was one of the best presents that such a close friend could give us! Jez Dickson was the most fantastic photographer, he was everything you could ever want from a photographer, he was a pleasure to be around, very relaxed, we hardly ever saw him during the day as he was so discreet and yet he was everywhere at the same time. Our key focus on the day was to capture the essence of the day, the atmosphere, the emotion and the party — and he more than captured that. We now have a stunning collection of photographs that have provided us with countless images of our big day that we want to frame and keep! We had the first edit of photographs within a week of the big day, and the full collection a couple of weeks later — he has been an absolute dream to work with and I couldn’t recommend Jez highly enough. 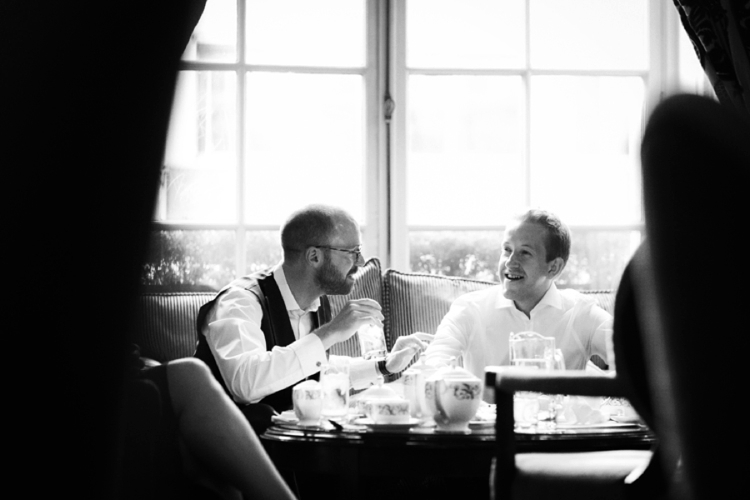 Our videographers were the lovely Andrew and Marco from The Filming Business — they also had the perfect attitude on the day, they were absolutely lovely to have around and from the footage we have seen they have captured some fantastic moments from the big day. 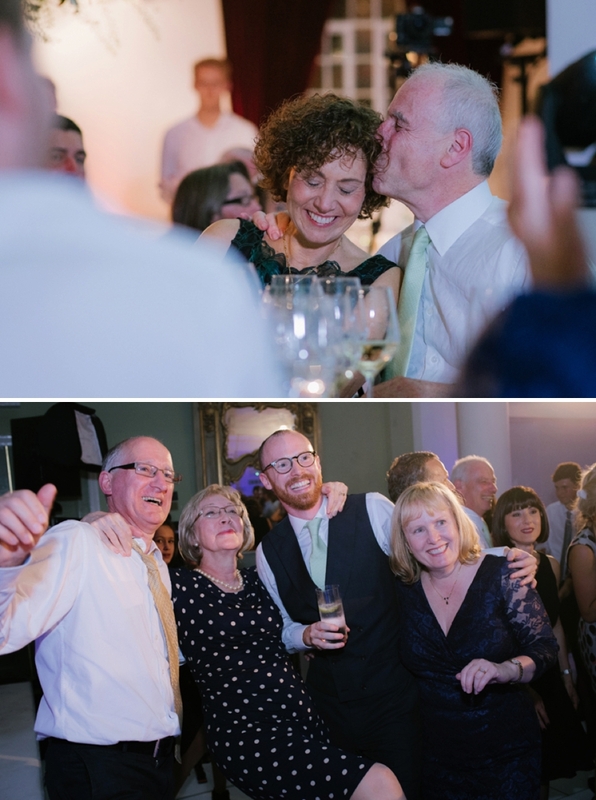 It was brilliant to see behind the scenes and spot a few kisses on the dancefloor that we hadn’t known about on the day! 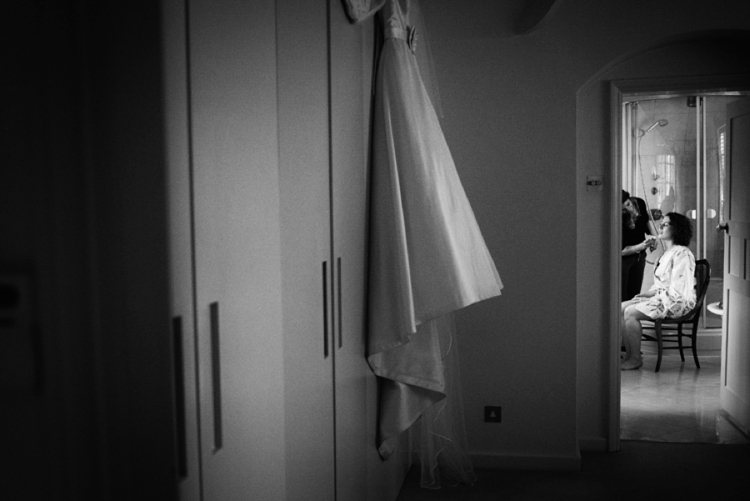 (See Lucy and Matt’s wedding film at the bottom of the post). We loved our photo booth! And just in case any of the big day hadn’t been captured by Jez and the Video team we had King of the Booth so that we could see what our guests got up to on the big day. They made brilliant face masks of Matt and I and the quality of photos were outstanding. 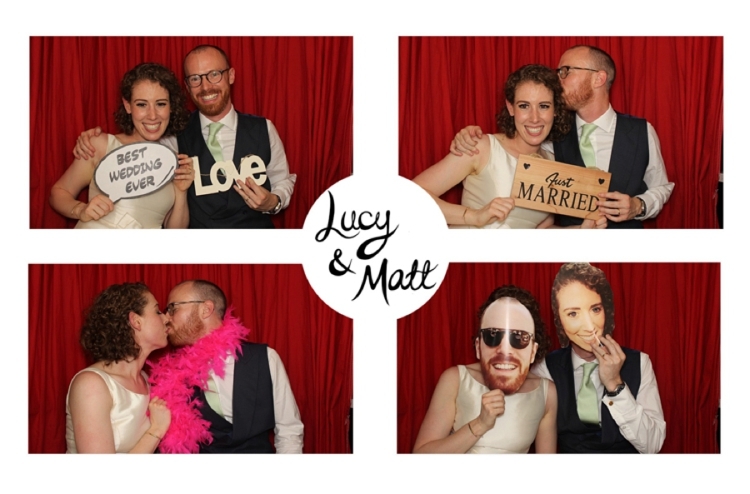 We adore the photobooth pics, and they shared their footage so that The Filming Business could incorporate some of the inside the booth footage into the wedding video — which is truly hilarious to watch! 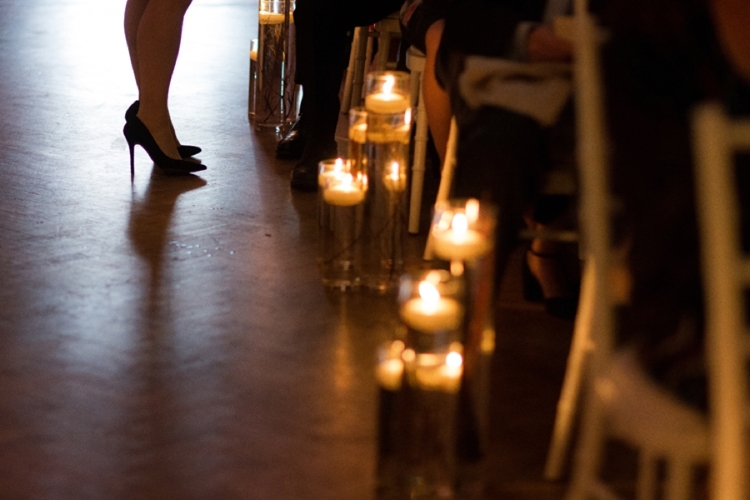 We were fortunate enough to use the world’s greatest caterers, By Word of Mouth. Not only was the food outstanding, but the service they provided was truly on another level. They were an absolute delight to work with throughout the entire process, from the tasting evening where everything was perfection to the big day where they ensured that we never went without a drink in our hands and food was brought to us the minute we sat down after working the room, and post photographs they made sure we had everything we needed. James ran a tight ship and the staff they used, plus the quality of food was out of this world. If I were to do the whole thing over again I wouldn’t dream of doing it without them! My favourite memory of the food tasting was trying the mini bagels with smoked salmon and cream cheese for our midnight munchies — while delicious they were filled with Scottish Smoked Salmon, which most jews will find too heavily smoked and thickly cut — within seconds of explaining this to James he knew what I meant and ensured that he could find some nice Jewish smoked salmon for us! I spent every summer in Italy as a child and after lunch most days we would all have a shot of chilled peach vodka- when it came to shots on the dancefloor we really couldn’t have had anything else! They went down a treat! 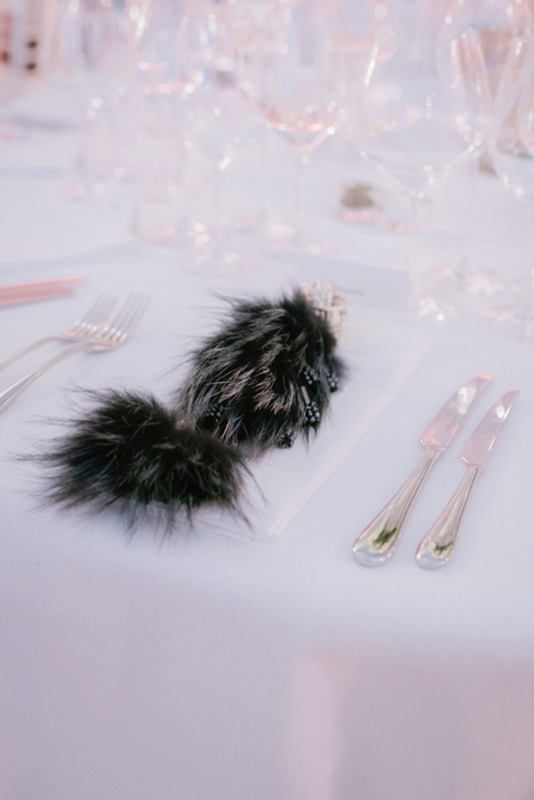 As mentioned earlier my father is in the fur trade, and aside from the beautiful stoles he made me, my mum and sister he also provided the wedding favours — incredible navy fox charms/pompoms that had beads saying L♥M! Normally at the end of a wedding the tables are littered with left behind favours — definitely not in this case! Not a single charm was left behind! 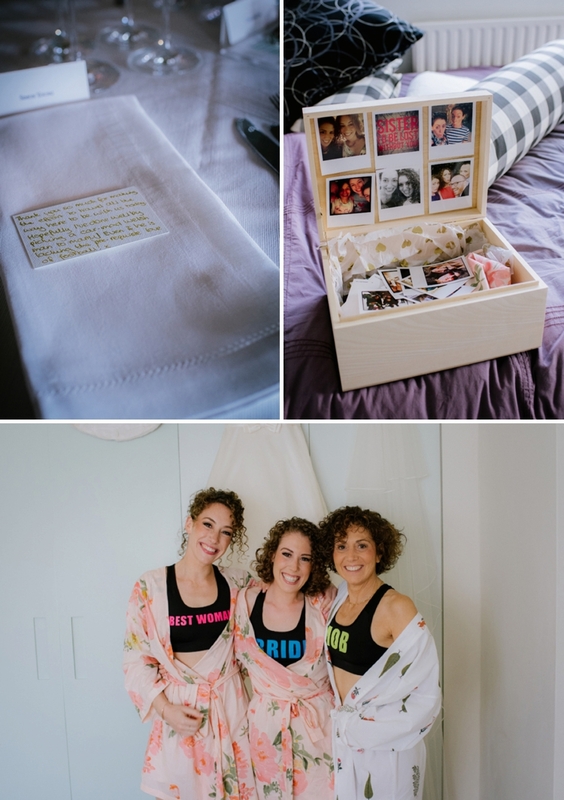 Matt and I were completely overwhelmed in the run up to the wedding by the incredible generosity and amount of well wishes and we really wanted to let our guests know how happy we were that they were there to share our big day with us. 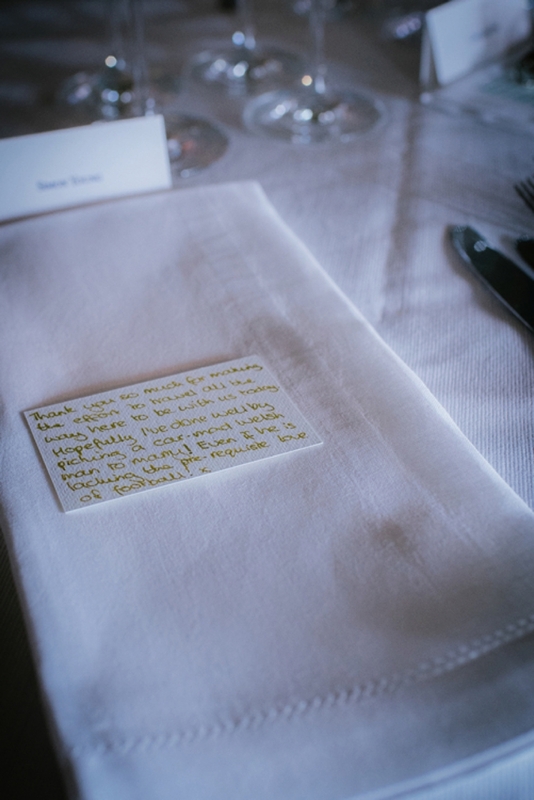 So we hand-wrote 200 individual cards so that each guest had a personal note waiting for them on their place at the table. 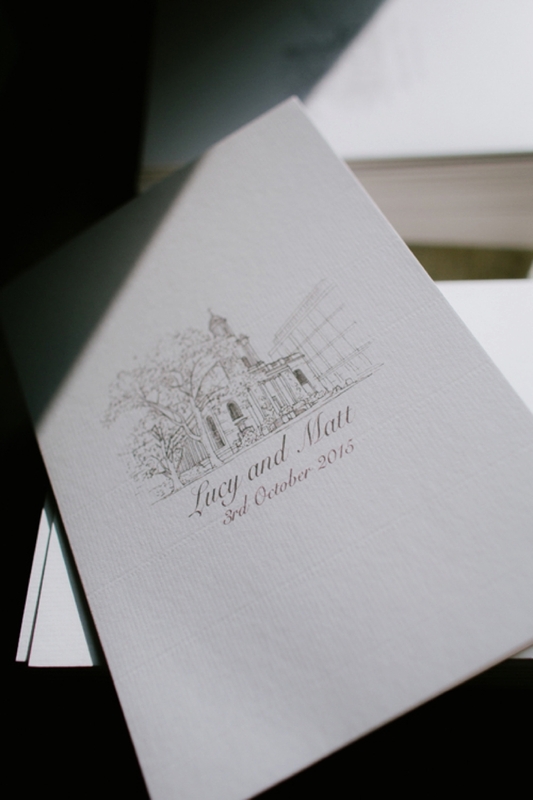 It was a lengthy process writing all 200 cards, and ensuring that each was personalised so that it meant something to each guest — it is the best decision we ever made and were inundated with comments about the notes after! Speeches.. including a bride’s speech of course! 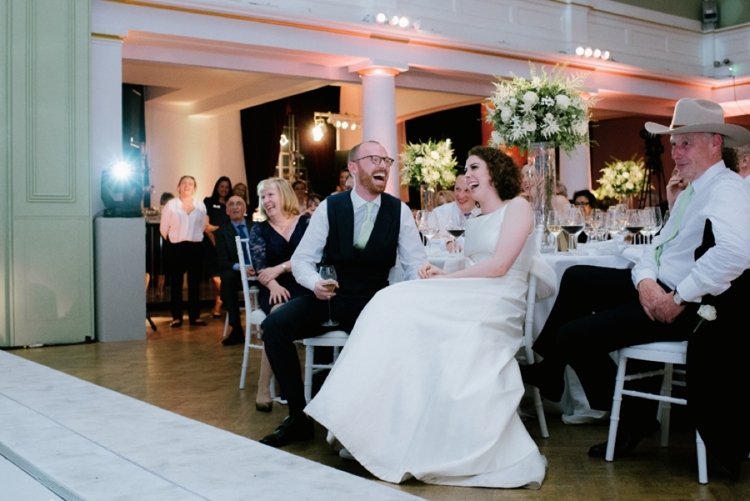 On the day I decided that I wanted to make a speech, it’s definitely not right that only men are allowed to speak on the big day — so after the starters and before dessert I took to the stage, I only spoke for a couple of minutes, but it was the only speech without a single note which I’m very proud of! When Matt asked my Dad for my hand in marriage he emailed him to get a date in the diary. Being a father of two girls it didn’t take him long to realise why Matt wanted a man to man chat, and they put a date in the diary for the following week, just before we flew off to the Amalfi Coast where Matt proposed. At the time of receiving the email my Dad was in Dallas on business and he decided he needed to buy a present for his potential new son-in-law and himself — so he went and bought them matching stetsons! During the groom’s speech Matt bought out the hat and gave it to my dad which he wore for the remainder of the speeches! 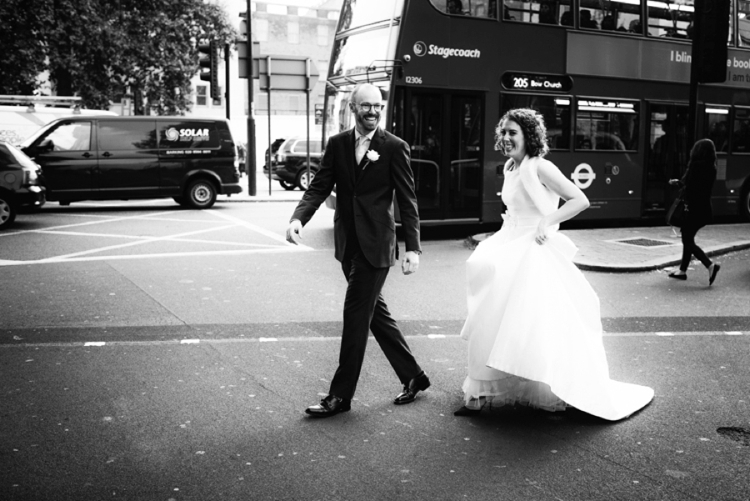 We were staying at the Langham on the night of the wedding, which is just down the road from the venue, so we walked, in full wedding regalia down Portland Place to the hotel — it was such a surreal moment that I will remember forever. My key advice is to pick people you like working with — of course you need to like the make-up/photos/food etc but if you know that you like the people who will be involved in your day then that is the most important thing! In the morning, while getting ready, we had some amazing people surrounding us which helped hugely with my nerves. My mood changed from sheer excitement to terror and every emotion in-between so being around people who were easy to talk to, entertaining and didn’t put any extra pressure meant that we can all relax. 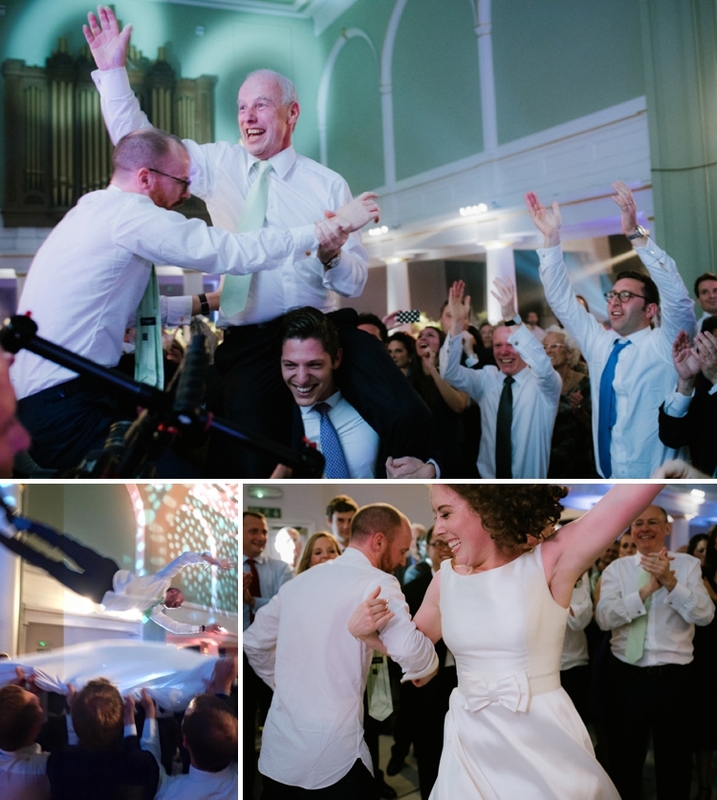 The second you see him at the other end of the aisle everything disappears, so just make sure that you can make the most of those moments before hand and try and enjoy the madness as much as you can!